To call Joaquin Phoenix one of our greatest living shape-shifters is to do more than acknowledge his range. It’s also a good way to describe the bold physicality of his transformations—how he twists his frame to accommodate the distinct corporeal presence of a scrawny cultist clinging to his sanity, a paunchy academic in mid-life crisis, or a lanky hipster sad-sack in love with his operating system. He truly embodies each new character he plays. Here at Sundance, there are two different opportunities to marvel at the wonders Phoenix can do with his skin and bones. I wrote about one of them, Lynne Ramsay’s mesmerizing noir nightmare You Were Never Really Here, when it premiered at Cannes last May; in the extra weight he carried like a weapon, in both his increased size and the scary lurch of his movements (call it a lumbering grace), the actor earned an adjective I wouldn’t normally think to apply to him: intimidating. 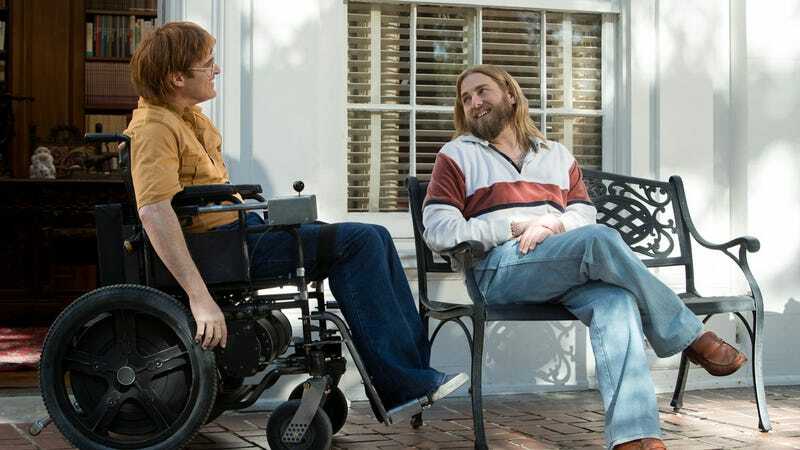 On the other end of the spectrum is Don’t Worry, He Won’t Get Far On Foot (Grade: B), Gus Van Sant’s peculiar, ultra-earnest biopic about the late cartoonist John Callahan. At 21, Callahan survived a car wreck that left most of his body paralyzed, which means that Phoenix spends most of the movie in a wheelchair, moving only his head, neck, and—stiffly, limitedly—his arms. For an actor like Phoenix, for whom mannerism and body language are essential tools, the part presents a major new challenge, and it’s exciting to report—through wordplay the self-deprecating Callahan might appreciate—that he rises to the challenge, his reduced range of motion looking involuntary rather than labored, at least to these eyes. Don’t worry, Don’t Worry isn’t some tearfully inspirational tribute to Callahan’s triumph over his disability. It’s a tearfully inspirational tribute to his triumph over alcoholism. Based on the artist’s memoir of the same name, which heavily chronicled his battle with the bottle, the film believes so deeply in the AA process, in its value and necessity and effectiveness, that it could reasonably be retitled 12 Steps: The Movie. (There’s a whole montage devoted to step nine, with Callahan embarking on a rather literal apology tour.) The uplifting nature of this true story naturally triggers Van Sant’s pesky sentimentality, with scenes that recall the hug-it-out, therapeutic catharsis of Good Will Hunting. But this is still the writer-director’s most formally interesting, emotionally involving movie in a decade, however little that may really be saying. Van Sant, to his credit, finds plenty of ways to disguise or undercut the biodramatic conventionality of the material. The narrative initially unfolds in nonlinear fashion, leaping into flashbacks to Callahan’s pre-accident days, overlapping a series of later speaking engagements (a trick recycled from the filmmaker’s last biopic, Milk), and echoing the recitations and repetitions of AA by returning perpetually to significant turns of phrase, like the particular way Callahan always describes the mother who abandoned him. (Another reoccurring device: the transformation of his sketches into animated interludes.) Van Sant’s script boldly omits some of the expected beats, thanks to its fairly narrow focus on the cartoonist’s fight against addiction; it never gets to his celebrity or his death (bread and butter for most artist biopics), because those things happened later. The support-group meetings are the meat of the movie, as Callahan bonds with his fellow addicts, under the empathetic, occasionally exasperated tough-love guidance of his sponsor (a terrific, cast-against-type Jonah Hill, rocking a real hippie Wyatt Russell look). They have no pity for him and no patience for his self-pity, and Van Sant makes the implicit case that this attitude—this refusal to condone victim complexes—strongly informed Callahan’s controversial work, which was both famous and infamous for its mordant irreverence on serious topics, including his own disability. Don’t Worry is already falling victim, critically speaking, to the middle ground it occupies: It’s too maudlin for some tastes, too offbeat and sluggishly paced for others. But Phoenix anchors the film to an emotional reality, and there’s something to be said for how Van Sant collides his dueling affinities for cornball uplift and oddball experimentation—sometimes in one scene, as when Phoenix’s Callahan confronts his mommy issues by talking to a phantom projection of his absentee parent. Punching up conventional content with unconventional form is becoming an early theme of the festival, judging from day two’s big premieres. There’s an element of that, too, in American Animals (Grade: B), which finds documentarian Bart Layton relocating the true-crime fascination and unreliable point-of-views of his The Imposter to a narrative project. He hasn’t even ditched the nonfiction entirely: To retell the true story of four college kids who plot to rob the rare-books collection of their campus library, Layton disrupts his scripted scenes—featuring Evan Peters and Killing Of A Sacred Deer’s Barry Keoghan as the in-over-their-head ringleaders—with talking-head interviews with the real culprits. It’s akin to what Errol Morris recently accomplished with Wormwood, only with the ratio of real to recreation flipped. And Layton’s trickiness doesn’t end there: For a while, anyway, he has fun with the rare opportunity to put the two modes in conversation, sticking his real-life subjects in the frame with the actors playing them, drawing attention to the sometimes vast chasm separating dramatizations from the truth. The film basically opens with a cheeky mislead, slapping a “This is not based on a true story” disclaimer on screen, before immediately blotting out the “not based on” to cast the veracity of the story under suspicion. Those unfamiliar with the film’s ripped-from-the-headlines inspiration (I’ll confess that I had to look it up afterwards) are hence left wondering if they’re watching true crime or the imitation of it. Alas, that slipperiness turns out to be more of an accent than a central focus. For all its mode-bending gamesmanship, American Animals is ultimately a fairly straightforward heist movie, albeit a stylish and engaging one. Like many of the recent films with American in their titles, it’s also a kind of Scorsese imitation (note the frequent needle drops, including Donovan’s “Hurdy Gurdy Man,” which should be verboten after Zodiac) with thoughts on the national character. In this case, at least, the thesis is sound enough, with Layton making the case that these four kids lit their futures on fire out of a particularly generational anxiety: the nagging suspicion, instilled by years of being told that they could be whatever they wanted, that their life path wasn’t exciting, interesting, or significant enough. Whether you buy all that, American Animals mostly works in the way all good films about best-laid-plans going astray do. The actual heist sequence is a tense triumph of black-comic suspense, as these kids catch up to what we know already, plummeting through the holes in their plan.